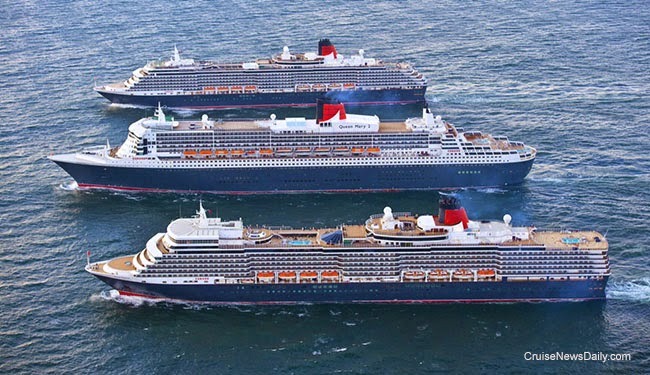 Cunard Line's Three Queens - flagship Queen Mary 2, Queen Victoria and Queen Elizabeth – are sailing together today (Saturday) toward Southampton where on Sunday they will arrive together to mark the start of Cunard’s 175th anniversary year. Today, however, at noon they welcomed the new Royal Baby with a simultaneous sounding of the ships’ whistles (foghorns). Cunard said that following the time-honored Magpie rhyme beginning "One for sorrow, Two for joy," the fleet sounded their whistles three times in unison, "Three for a girl (Four for a boy)." Ports around the world are vying for the opportunity to host a cruise ship, and more than anything they’d like to host one for a series of turnarounds. Now imagine one of the world’s largest cruise lines coming to a port unsolicited and offering them that opportunity for what will be their newest ship, and second largest type in the world carrying 5,000 passengers. Who would turn down an opportunity like that? Auckland, New Zealand. That’s who! It seems Auckland has decided to tell Royal Caribbean they can't host four turnarounds of Ovation of the Seas during the 2016-2017 season. Norwegian Epic arrived at its new home port of Barcelona this morning, but this is more of a change for the ship and Norwegian than its usual spring arrival in the Mediterranean. Since it entered service, Norwegian Epic has split its time between seven-day winter programs in the Caribbean and seven-day summer programs in the Mediterranean. This summer will be no different, but this year when the fall comes, Norwegian Epic will be staying in Europe, because it will be permanently homeported at Barcelona. But that’s not the only change for Norwegian Epic. Proving that the wheels of justice turn slowly, back in 2011 we reported on the case of a 20-year-old woman who was detained on St Maarten when a cabin steward aboard Carnival Dream found the dead body of a newborn infant under a bed in her stateroom. Now three and a half years later the woman, now 24, is pleading guilty to a charge of involuntary manslaughter in a plea bargain in US district court in Indiana. So Real, Will You Really Have to Go? What’s it really like to be on a cruise ship? Will I feel claustrophobic? What are the shows like? To get the answers to these questions, wouldn’t it be great to be able to experience being on a cruise ship before you actually go on a cruise? Silly idea? MSC Cruises has partnered with Samsung to create a virtual reality cruise that potential cruisers can experience at their travel agent’s office simply by slipping on a virtual reality headset. Futuristic? MSC is demonstrating it beginning Friday at Expo 2015 in Milan. When Expo closes in the fall, MSC will begin distributing it to their top travel agents. The complete story appeared in the April 29 edition of Cruise News Daily. Windstar's second celebrity host for a Private Event. Carnival announced today they are moving three ships’ home ports next year. This will give customers new options and freshen things for regular customers, but it’s also obvious from the announcement that Carnival has really understood that customers have come to find the repositioning cruises are quite desirable if they are a bit longer and include interesting combinations of ports. In the end, Carnival Victory will be moving to San Juan for seven-night cruises from there beginning in November 2016. Carnival Ecstasy will move to Charleston for four- to seven day cruises beginning in February 2016, and Carnival Fantasy will operate three- and four-night cruises from Miami beginning in February 2016. Details appeared in the April 28 edition of Cruise News Daily. When Holland America’s Ryndam and Statendam transfer to P&O Australia in November as Pacific Aria and Pacific Eden, they won’t just have new names. After a dry dock in Singapore, they will have new identities. 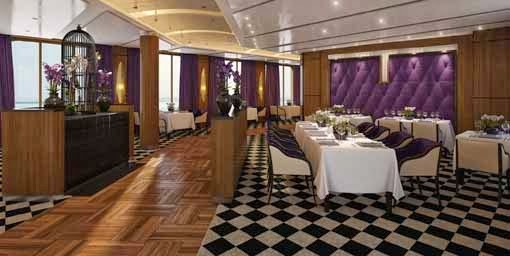 The major refurbishments will take modern Australian cruising to the next level, according to the line. The complete story appeared in the April 27 edition of Cruise News Daily. Additional renderings on our Pinterest board. Images courtesy of P&O Australia. All rights reserved. May not be copied or used without permission. Royal Caribbean canceled today’s four-night sailing of Majesty of the Seas from Miami to the Bahamas so the ship could go to an unscheduled dry dock in Freeport. Details appeared in the April 27 edition of Cruise News Daily. Seabourn has partnered with three-starred Michelin chef Thomas Keller to create new menu items and to develop a new signature restaurant to be added across the fleet.